We serve this as our main dish for dinner a lot of times but you could easily use it as a side dish to a grilled chicken or fish dish too. The possibilities are endless. 1. In a large skillet, heat oil over medium-low heat. Add lemon zest and garlic. Cook for 1 minute. Stir in Italian seasoning and crushed red pepper and cook for an additional minute. 2. Add butter to pan and, once melted, add baby spinach, zucchini noodles, and lemon juice. Once spinach begins to wilt, stir in Parmesan cheese. 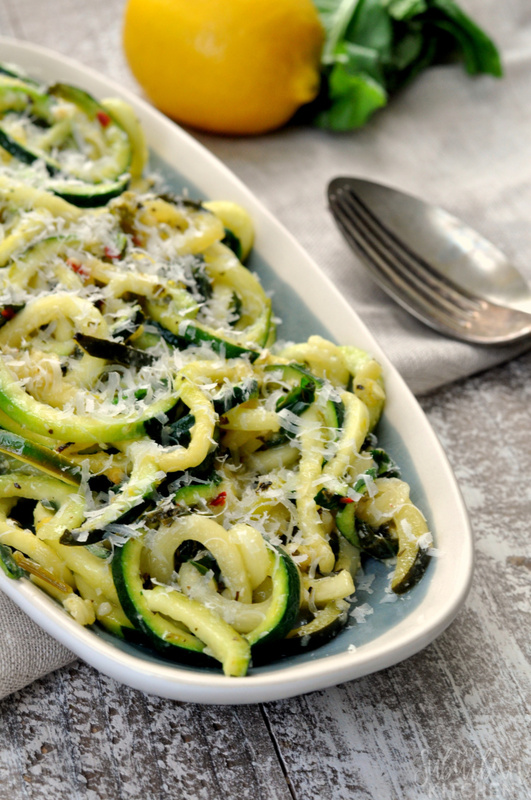 Serve immediately topped with additional grated Parmesan and chopped, fresh basil. The two awesome things about this recipe, in addition to being a healthier take on an old favorite, is that it only uses one pan and is ready in under 15 minutes. You can’t beat that on a busy weeknight when you might other turn to a take out menu or drive thru! When choosing your Parmesan for this, be sure to get a higher quality one that you grate yourself. It will really make a huge difference in the overall taste of the dish. You might also find yourself sneaking little pieces of it while you cook too (I know I do!). 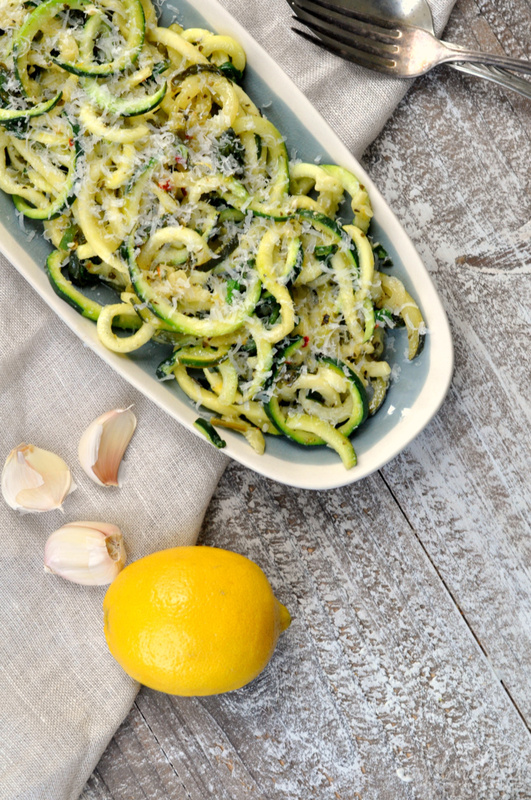 Oh, and with all the cheesy goodness, I bet even the pickiest eater will be asking for a bite of these one pan lemon garlic zoodles. Hi – I am so glad to hear you enjoyed the recipe. I do not cook my noodles first because I like them on the crisper side. I just toss them in the pan at the end so they get hot. You absolutely can cook them first if you want a softer vegetable noodle. I love zoodles!!! 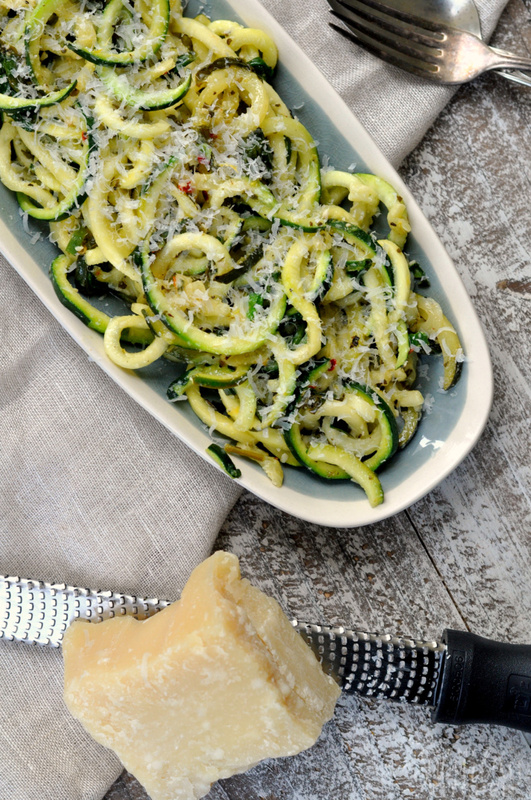 Perfect recipe for those summer zucchinis! This sounds amazing! I love how it’s a healthier version of pasta! Such a delicious and light meal! We love zucchini! This needs to happen for dinner! 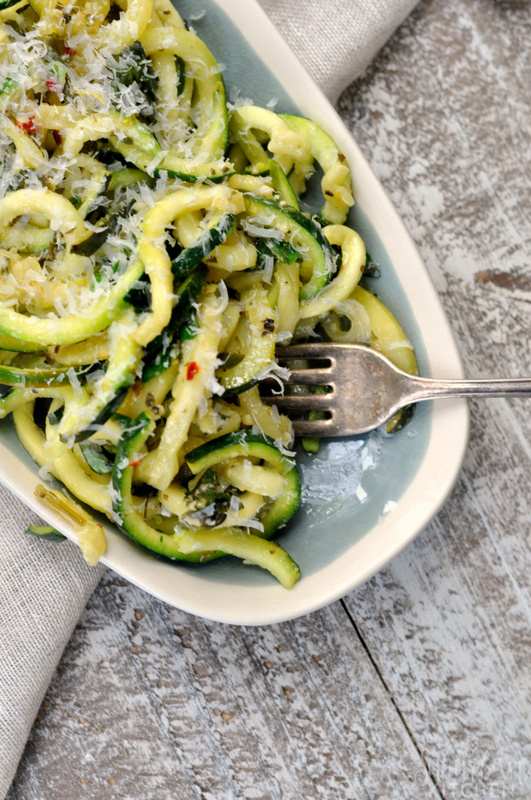 I love zoodles! It looks gorgeous and really tasty! Is this recipe 648 calories per serving? Can you provide any additional nutritional information?